Gutters are vital to the safety and function of the home. Our team at Midland Gutter Pros strives to use our experience and expertise to perfect your gutter system. New builds, remodels, and old homes alike can all benefit from a gutter upgrade. Properly installed gutters will allow water to continually runoff the roof and be funneled away from the foundation of a house. Not all homes need gutters, such as those in arid climates that do not endure heavy rain, but here in Midland, Michigan, this part of a home’s exterior is absolutely necessary. In addition to functionality, gutters are great for enhancing the curb appeal of a home. We know that for many homeowners who need work done, the primary concern is always price. Gutter installation cost per linear foot can vary depending on the circumstances, plus the cost of installation. Vinyl gutters are the most affordable option, with the highest quality pieces being out top product. This makes vinyl gutter installation a good option for many projects. There is a vinyl for every budget. More expensive options—think metals such as steel—are the highest quality and most durable option available. For those who need metal roofs, metal gutters are a good choice. Here at Midland Gutter Pros, we are happy to provide a gutter installation estimate based on the specifications of your home and your needs. For those who want to avoid hefty gutter installation costs and have a knack for being handy, taking up the trade is an option. With proper gutter installation instructions, the job can be done successfully. However, some projects are more complicated than others and may require professional support. 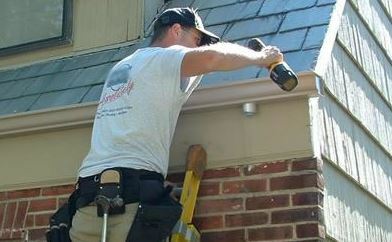 Few gutter installation DIY attempts use advanced techniques in the industry, such as seamless gutters. Seamless gutters are better at minimizing leaks compared to traditional gutters. Over time, even well-constructed, amply sealed edges can degrade, causing water to escape and leak out of a gutter system. In addition to ensuring the longevity of results and providing insight into advanced techniques, experts like us can also make sure that city codes are met in all aspects of the installation process, regarding things such as drip edge requirements, slope requirements, and so on and so forth. Even for those planning on making a DIY project of a gutter problem would benefit from reaching out to us to consider how we can support your efforts. For any and all gutter advice, come to Midland Gutter Pros. In addition to installation services and support, we offer gutter cleaning, gutter repairs, gutter maintenance, and more. If there is a gutter problem, we can fix it. Located just west of the Saginaw Bay and east of Mt. Pleasant, we can help homeowners across Midland and in the surrounding areas. We pride ourselves on being the best gutter company in all of Midland. See for yourself by becoming one of our satisfied customers. Please contact us through our website or via phone to get the ball rolling on your gutter needs.